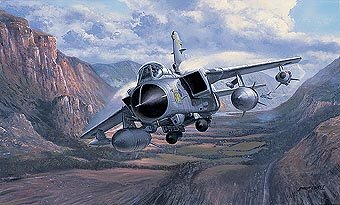 Today's RAF Tornado's and the aircrew that fly them offer a world-class interdiction/ground attack and reconnaissance package that is second to none. The Tornado GR4 is capable of supersonic speeds and flight at low-level, making it one of the most potent attack aircraft in the world today. New systems and weapon's upgrades will ensure that the Tornado remains a versatile, effective and vital platform for many years to come. Primary Edition signed by three pilots and three navigators. Artist Proofs and Remarques are signed by five pilots and three navigators. The following aircrew have signed copies of “Tornado Strike”. Wing Commander Alistair J. Byford MA RAF (Officer Commanding 31 Squadron) He has flown nearly 3000 hours including 10 operational deployments. Sqn. Ldr. Andrew Arnold, Navigator, RAF, 31 Sqn. Executive Officer.